Bull Run house values are in for a wild ride, as new home sales continue to lead existing home sales by a factor of 2 to 1. New home construction in the Bull Run Subdivision has been relatively strong, mostly due to liquidation of lots at far cheaper prices than were seen during the boom of the housing market. While this is good news for the builder, it is not so good news for existing home owners who continue to see Bull Run house values decline. The real estate graph below shows that Bull Run house values are still on an overall decline trend, though existing home values have bumped along fairly flat for the past two years. But if you look to the left vertical axis, you can see that existing home sales (green resale units) are averaging about one home sale per month. You have to wonder what will happen as more people need to relocate out of this newer subdivision. The red line above shows that Bull Run house values for newly constructed homes has been on a steady decline, and it is likely that these lower home prices is why buyers have been attracted to Bull Run. But how low can new home prices go in Bull Run? And what is this doing to the value of existing homes in Bull Run? I think we'll see the builders hit a point where they can no longer bring new product to the market at the values we are approaching, and then we'll find out how badly buyers want to be in Bull Run. Will they pay higher prices for existing home sales, or will we see a rash of distressed homes hit the market ... only time will tell. People who want to sell a home in Bull Run will need to be ready to compete with newer homes, and offering buyer closing cost assistance could be useful. 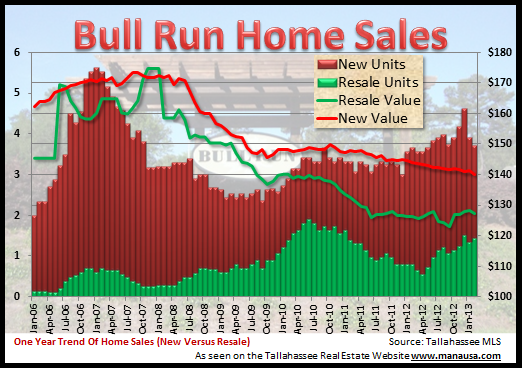 Currently, there are 16 homes for sale in Bull Run in the Tallahassee MLS. Bull Run home sales for the past two years are listed below.